Budget safety shoes that don't skimp on the safety! 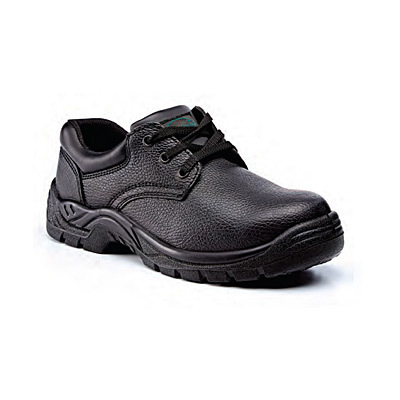 The lowest priced option in our range, these black grain leather safety shoes have been manufactured to EN ISO 20345, with 200 Joule steel toe protection and puncture resistant steel midsole. Available now for immediate dispatch and very rapid UK delivery. These may cost less than just about everything else in our range - they certainly don't have the style or sheer brashness of some we sell! - but that doesn't mean that they provide any less in the way of protection. 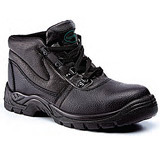 They've been designed to do a job effectively and at a price that may just tip the balance when you need to make up your mind over which safety shoes to buy. 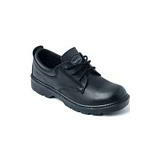 Nor are they any less comfortable - the padded collar, comfort lining and full foot bed mean you'll barely notice you're wearing them as you go about your day's work. Which, when you think about it, is all you really need good protective shoes to do! 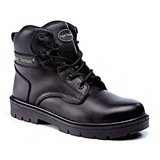 Derby Safety Boots - the safest safety boot on the market!